Like me, I’m sure you’re looking forward to one or two Thanksgiving treats that you’ve grown to love over the years. Maybe you’re the designated apple pie-maker, or your Mom’s green bean casserole makes putting up with your obnoxious uncle Andy worth it. Personally I love mashed potatoes, and in particular an artery-clogging version my family blithely calls “Party Potatoes,” which includes four different kinds of high-fat-content dairy products. My sister makes a pretty mean batch, and spares no calories. What can I say, once a mid-Westerner, always a mid-Westerner. I am grateful for Party Potatoes, but on this weekend before the hoilday as I savor some time alone, what I’m most grateful for is gratitude itself. The feeling of warmth and expansiveness I get in my chest grows as I count my blessings, focusing on the people and creatures closest to my heart. This morning at my altar I started with my usual list of loved ones, then expressed gratitude for a warm dry house on this rainy cold Sunday, work that I love and that supports me, and finally, robins. 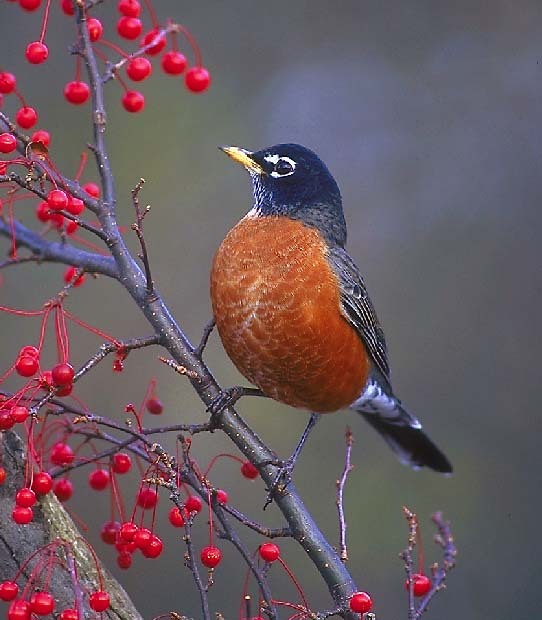 Last week I saw two robins feasting on red berries in a friend’s yard and their hopeful little red breasts and white-ringed eyes made me forget the cold and the bare branches of November. I felt so grateful for their presence I got tears in my eyes. This feeling has continued to salt my meditations all week, and helped me focus my attention on small things that can bring great joy. What small things bring you great joy during this dark time of year? And have you noticed that the more you give yourself permission to feel gratitude, the more joy you feel? And the more joy you feel, the more grateful you feel? Kinda’ amazing how that works. « Whose business are you in? 1 response to "Gratitude – an invitation to what you love most"
Oh, Jill, this was truly an inspiration to me. As one who is responsible for bringing (most of) the Thanksgiving meal to the table, I will “feast” on each small part. Yes, our spiritual capacity expands our internal space and leaks out to others when we fill ourselves with gratitude. YOU are a robin in my soul.